The next thing I wanted to do is to create a path through the tropical garden. However much I wanted to just hack my way into the jungle, making my own pathway through the foliage, I think realistically I needed to make a pathway. I wanted to have a meandering route that didn’t go straight from A to B and also have a way to see every area and have a focal point in each corner. It’s only a small area so it didn’t take long to create the path by digging down a few inches along the route I’d chosen. 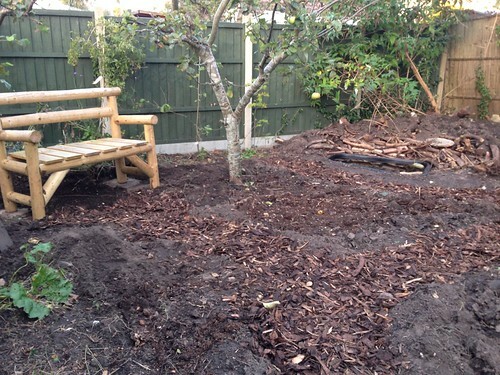 I then filled the track with the Leylandii chippings from my wood chipper topped up with bought bark chippings. 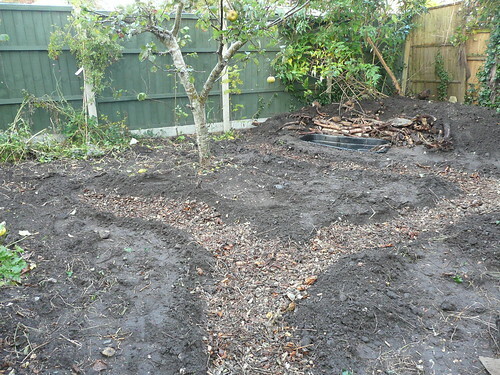 The next thing to do was to fill the pond and put in some interesting features. Previously as a weekend project, my dad and I made a rustic looking bench; so that had to go in somewhere. I also had an old galvanised wash tub and bath which I needed to put somewhere so they were to go in too. 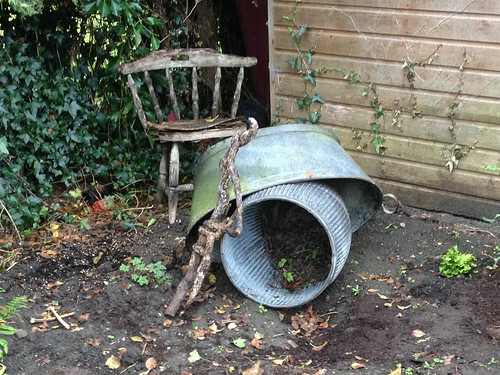 Here’s what I did with the galvanised bits, I’m thinking of entering it into the turner prize you know! Now once again, I know it looks crap BUT you’ve got to imagine it amongst all the palms and monkeys, etc. Just small bits of it will be peeping through, just enough to catch your eye and make you stop and think. Pretty isn’t it?! It looks a bit new at the moment but it’ll age and mature, it’ll blend into it’s surroundings, things will grow up it, grow through it and it’ll look like it’s always been there….